Building an NGA service portfolio is a challenging task: the cost of the new infrastructure being deployed is such that profitability can only be obtained if significant proportions of customers switch from legacy broadband to NGA broadband. Balancing price and attractiveness is tricky, but the promise of new and innovative services should be part of the NGA story and can constitute a factor of attractiveness in and of itself. 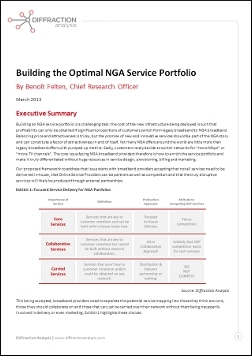 This report not only explores service offerings of dozens of operators to highlight best practices and interesting approaches, it outlines a method to optimize service portfolios for NGA players no matter which technology they chose (FTTH, FTTN or Docsis 3.0). This report is a must read for broadband providers entering (or already operating in) the NGA space, but also for infrastructure providers wanting to understand their customers’ ecosystem and vendors trying to advise their operator customers.